Kingdom Konsultant Travel Blog: Flame Tree BBQ: BBQ with a View! Flame Tree BBQ: BBQ with a View! If you’ve been following our blog then you know that there are many restaurants at Walt Disney World that our agents adore. So far we have been highlighting table-service locations, but today I want to share with you my favorite counter service location in all of Walt Disney World—Flame Tree BBQ! Place your order here, then find a seat to the left. I’m a Southern gal, so naturally I love, love, LOVE some good BBQ! Whenever anyone asks for advice on what counter service location to dine at, top of my list is always Flame Tree BBQ. As a matter of fact, on the last day of our honeymoon my husband and I made a quick jaunt to Animal Kingdom for the sole purpose of grabbing lunch at Flame Tree BBQ and riding Expedition Everest one last time before the Magical Express picked us up. It’s that yummy! Flame Tree BBQ is in Discovery Island, just before the entrance to Dinoland. Just follow your nose. You can smell the savory, smoked meats from afar. This is a popular restaurant and during busy hours you might see people lined up since this is an outdoor locale, but don’t worry, the lines move pretty quickly. Once you have your food, head to the left of the counter to find seating. On your way to the seating pavilions you will see a condiment island with napkins, forks, ketchup, and BBQ sauce. If it is crowded be aware that you can also find condiments in the seating pavilions. Gorgeous view from the lower pavillion. All the seating is outside, but you won’t be melting away in the sweltering sun! There are several covered pavilions for you to dine under surrounded by lush greenery. 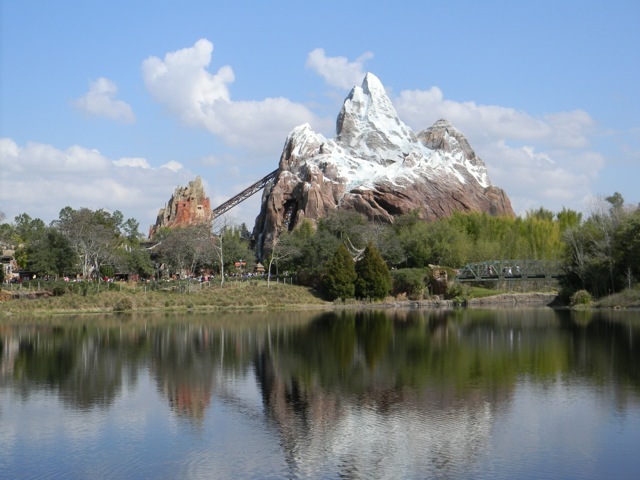 If you’re on the lowest pavilion you will be treated to a breathtaking view of Expedition Everest. The bright and colorful animal carvings found at the counter where you ordered follows you to the pavilions as well. Even the chairs have painted carvings. To the untrained eye it may appear to be a random assortment of animals included in the décor, but if you look closely you will notice that the theme for this restaurant is the Circle of Life. Yes, the literal Circle of Life. Look for the sign on your way to Dinoland! Now for what you really waiting for. What is on the menu? Entrees served now are: ½ slab St. Louis Ribs, Pork Sandwich, ½ Chicken, Ribs/Chicken combo, Barbecued Chicken Salad, Smoked Turkey Breast Sandwich, and a Fruit Plate. Most of these entrees are served with a side of beans and cole slaw. You can also order French Fries or Onion Rings. For the little ones they offer a Chicken Drumstick, Hot Dog, or Peanut Butter and Jelly Sandwich. If I had any complaint, it may be that the desserts didn't seem very inspired - Key Lime Mousse or Chocolate Mousse. If I am on the Dining Plan the next time I go here I will ask for a bottle of water in lieu of my dessert and satisfy my sweet tooth with a Brownie Paw from Kusafiri Bakery, but that’s a story for another blog! Portions here are pretty large and BBQ is a pretty heavy meal, so I think this is a great place to share meals. On my last trip we ordered 3 entrees and split them between 5 adults. We were all very satisfied without feeling stuffed at the end of our meal. I personally like the pork sandwich, but the ribs and chicken are delicious as well. To be honest I’m just lazy—a sandwich is a lot less work than ribs or a ½ chicken! The next time you are in Disney’s Animal Kingdom be sure to grab a meal at Flame Tree BBQ! Your tastebuds will thank you!